Minnesota Vikings tight end Kyle Rudolph has enjoyed two Pro Bowl seasons in his NFL career. His success has helped him establish a successful summer football camp here in Minnesota. 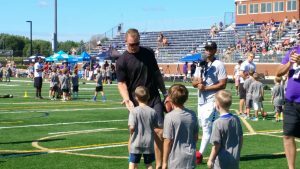 The two-day Kyle Rudolph Football ProCamp is taking place Tuesday and Wednesday at Providence Academy in Plymouth. 1000 youth, ages 6 to 14, are learning or improving their football skills and knowledge through drills and games with campers in their age group. This is Rudolph’s fifth football camp and has grown from 125 youth the first year to where it is now.